Cheesy Chicken Rigatoni - CRAZY good!!! The whole family cleaned their plates and went back for seconds! Such an easy weeknight casserole recipe! Can make ahead and refrigerate or freeze for later too! Chicken, rigatoni, cheese soup, evaporated milk, heavy cream, garlic mozzarella, cream of chicken soup and rigatoni. SO good! I wanted to face plant in the casserole dish!! LOL! 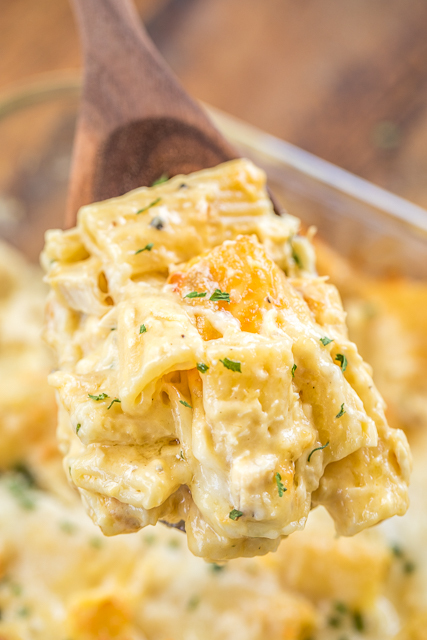 Stop what you are doing and get the ingredients to make this Cheesy Chicken Rigatoni right now! This is seriously delicious!! Like, I want to face plant into the casserole dish delicious. I am already planning on making this again next week. We just can't seem to get enough of it!! 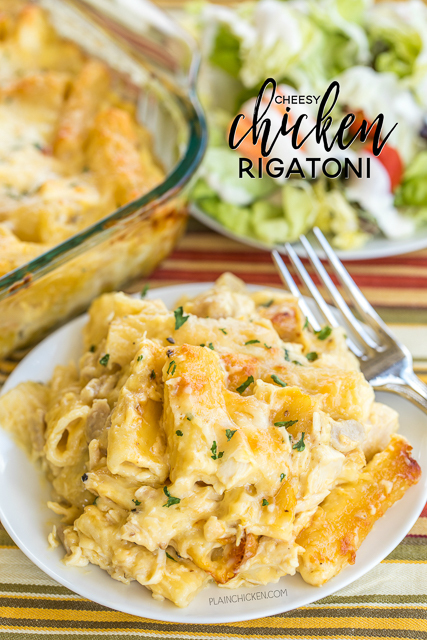 This Cheesy Chicken Rigatoni can be made ahead of time and refrigerated overnight or even frozen. It makes a ton. It would be perfect for a crowd! It is also a great way to use up any of the leftover Slow Cooker Rotisserie Chicken I shared earlier this week. This Cheesy Chicken Rigatoni only takes a few minutes to whip together and is ready to eat in under an hour. I used rotisserie chicken in this casserole to cut down on time. I made the quick cheese sauce while the pasta boiled and then just tossed everything together. Super easy! 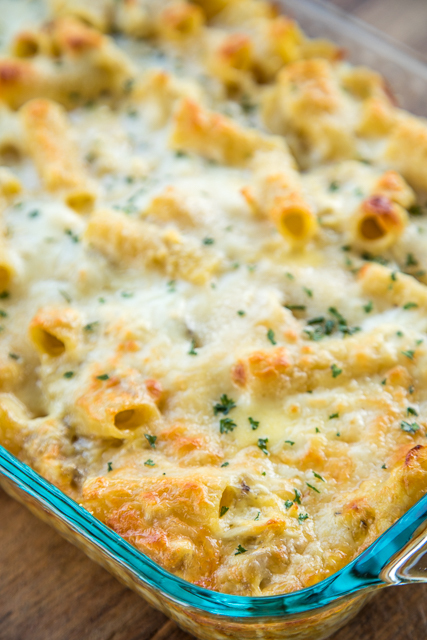 This Cheesy Chicken Rigatoni is definitely a new favorite in our house. 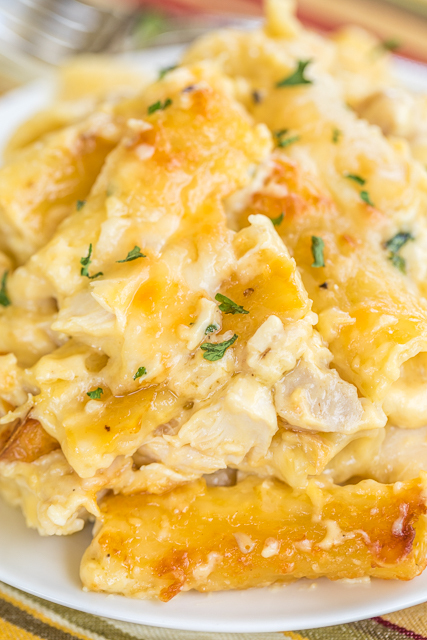 It is hard to beat warm cheesy chicken and pasta. You could even add some mushrooms and spinach to the casserole. YUM! Comfort food at its best!! In a large saucepan, combine cheese soup, evaporated milk, heavy cream and garlic. Cook over medium-high heat until sauce comes to a boil. Reduce heat and simmer 5 to 7 minutes, until sauce thickens. Remove from heat. Stir in mozzarella cheese, parmesan cheese and pepper. In a large bowl combine cooked pasta, cooked chicken, cream of chicken soup and cheese sauce. Spoon pasta into prepared dish. Sprinkle casserole with remaining 1 cup of mozzarella cheese and 1/4 cup parmesan cheese. Bake uncovered for 45 minutes, until bubbly and cheese is golden brown. What is a substitute for a can of cheese soup.??? Not sure. I used the can of Campbell's Cheese Soup and it was perfect. I think she might mean Cheddar Cheese Soup? So so good!! Whole family loved it and that does not come easy in our house. Thank you for the recipe! YAY!! SO glad to hear it was a success! Cant wait to try this. If i wanted to add spinach, should i use fresh or frozen? Does it just get added with the mix? I would use frozen. Make sure to thaw and drain the water out really good. I press it between paper towels and really ring it out. Just add it to the pasta mixture before putting it in the pan. Enjoy! Cant wait to try this. If i wanted to add spinach, would i usefresh or frozen? Should it just be added to the mix? I need to feed approximately 23 people. Would this be enough or should I double the recipe? I would probably do 2-1/2 or 3 of the recipe - Enjoy! Can I prepare the casserole ahead, and keep in the fridge until ready to bake? Would elbow macaroni work ok instead of rigatoni? I haven’t tried this with macaroni. You may need more macaroni than rigatoni since it is a smaller noodle. You will just have just have to use your best judgment on the amount of pasta.